Top Rated Stand Steady, Workspace Winner of 2014 Apartment Therapy's Best Affordable Standing Desks, brings you their newest product: The UpTrak Metro Standing Desk! This exciting desktop stand up desk can be used to sit and stand, is affordable, and is so easy to use. Simply place the UpTrak Metro Standing Desk on your desk, adjust it to your height, and you are ready to work standing up! When you are ready to sit down, open the levers and slide the top down the Metro rails. Now you're ready to stand at work and be healthy - who knew it would be so easy! Because with the UpTrak Metro, it's your turn - to stand at work, try a healthier work life, refresh your mind & body, and transform your office space! IT'S VERY LIGHTWEIGHT - only 14.5 pounds! IT'S DEPENDABLE - just pull the thumb levers and change the height, using the holes along the solid steel Metro rail rod. 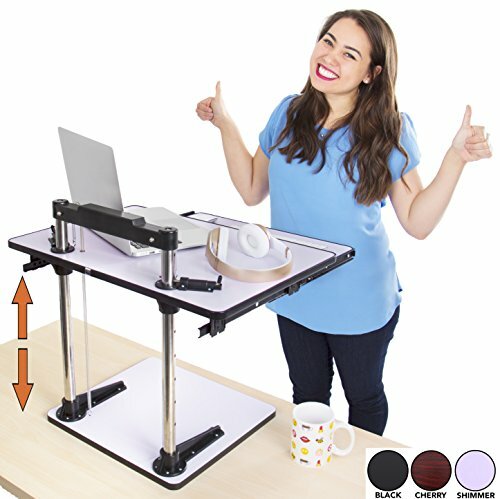 SPRING-ASSISTED LIFT - Unique and reliable spring feature assists the lifting/lowering of this adjustable standing desk. IT'S GOT A GREAT RANGE OF HEIGHT! The UpTrak Metro has a broad height range, which goes up to a very tall 18.25 inches for standing. BONUS KEYBOARD TRAY: Use the keyboard tray when you want to, and slide it under for storage when you're done. COLORS: Choose from selection of Colors: Black, Cherry or Shimmer White! ★ AMAZING VALUE: Got back pain? Sitting too much? Looking for a great fit for your cube and your budget? Want a sharp solution? The UpTrak Metro Standing Desk! This exciting desk has high functionality, is very lightweight, and has a bonus keyboard tray! The EASY choice for you, your back, AND your wallet! ★ SMOOTH HEIGHT ADJUSTMENT: Thumb levers pull in and out to set the height, while the dependable steel Metro rail rods give you a solid hold! You can choose the height that is right for you - anywhere between 2.25" to 18.25" - that's tall! ★ SPRING-ASSISTED LIFT: You're not demanding. Neither is the Metro. No complicated pumps, no electricity, utilitarian and modern. The two unique spring-assisted lifts which run from the base to the monitor level offer reliable support as you move the desk up and down - Wow! ★ VERY LIGHTWEIGHT: At only 14.5 pounds, you can move the UpTrak Metro from one cube to another - as easy as moving your laptop. This standing desk can go where you go, because it weighs so little! ★ BONUS KEYBOARD TRAY: The exciting retractable keyboard tray - pull it out when you need it, and store it when you don't. It's so great to have this option on a budget-friendly stand up desk workstation! Buy now & don't miss out on our lowest price ever!